Manufacturer & Supplier of Planetary Gearbox & Apex Planetary Gearbox. Our product range also comprises of CNC Controller, CNC Machine Control Panel and Servo System. 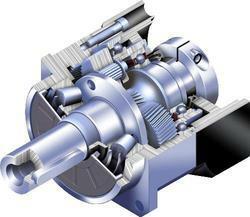 We are a paramount organization that is involved in offering high quality Planetary Gearbox. Our range is designed for direct attachment to synchronous servomotors. Simple and efficient lubrication and a balanced system at high speeds are the distinctive advantages of planetary gearbox for use in applications like machine tools and general production machines.